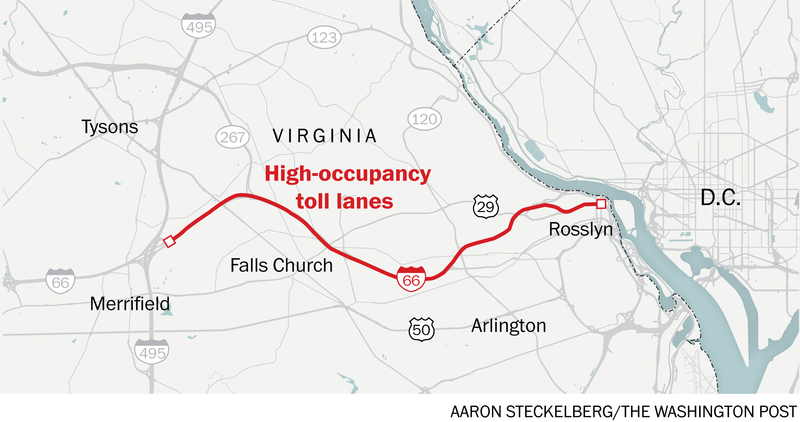 When the 66 Express Lanes opened a year ago, officials promised the tolls would mean a smoother ride on the interstate, a major east-west thoroughfare from Northern Virginia into the District that is infamous for its headache-inducing congestion. The state’s promise — less congestion and faster travel times during rush hour — has been fulfilled for many commuters able to pay or carpool, but the new toll system has had an adverse effect for many of the remaining road users. For some commuters, the rush-hour period has simply shifted later — outside the toll hours — and dumped them onto an interstate just as gridlocked as before. Some alternative routes have experienced more congestion from bailout traffic from motorists seeking to avoid the toll, and other commuters have longer trips into the city on Metro or have abandoned efforts to use transit because of inadequate facilities, according to a Washington Post analysis of data from state and local governments and transit agencies and interviews with commuters. The new high-occupancy toll lanes on one of the busiest highways in the Washington region have sparked dramatic shifts in commuter behavior, prompting motorists to alter their commute times and routes, data show, while yielding tolls as high as $47.50 — some of the highest per mile in the country. 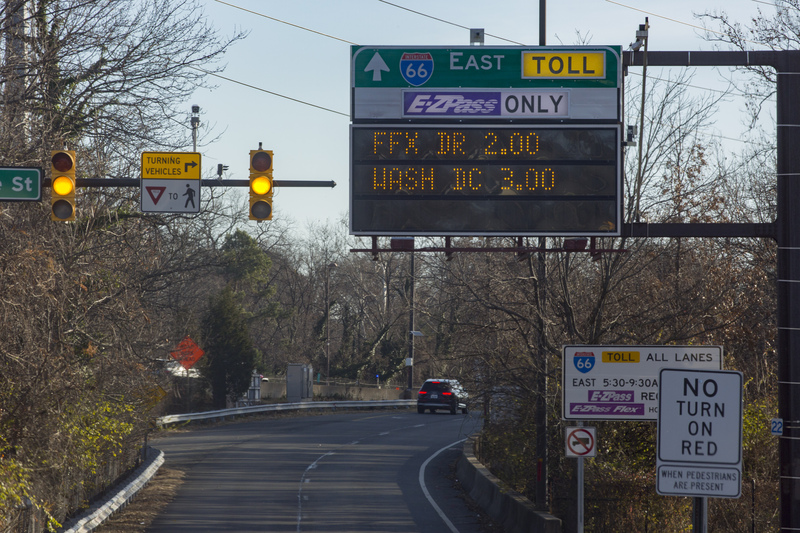 The expanded rush hours introduced with the toll system mean commuters who used to take I-66 during non-HOV hours before the toll system now have less leeway to wait for the restrictions to lift and still make it to work on time. The thousands of hybrid-vehicle owners who were allowed to use the HOV-2 lanes free, even if solo, can no longer do so unless they want to pay the tolls. Commuters willing to pay to use the lanes have been shocked by the high tolls, which average $35.50 during the peak of the rush at 8:30 a.m., data show. The average toll between 6:30 and 7 a.m. is $10, according to Virginia Department of Transportation data. 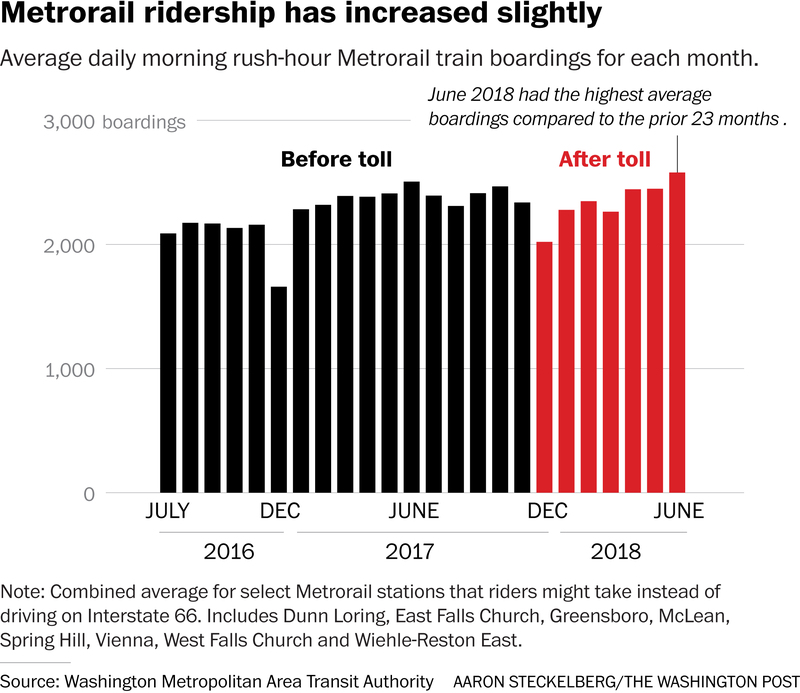 The average tops $20 in the 7 a.m. hour and stays above $30 in the 8 o’clock hour until dropping again around 9 a.m. As Komaragiri sat waiting, the toll to Washington at 9 a.m. was $20. The system is designed so tolls fluctuate to maintain a minimum average speed of 55 mph. As traffic increases, the toll rises to help manage the number of vehicles entering the roadway. There is no cap on the tolls, which change every six minutes. Motorcycles and vehicles carrying two or more people use the lanes free. Fewer than 1 percent of express lane users have paid tolls of $40 or higher, according to a VDOT report. Those who pay the most typically travel during the peak of the peak hour between 8 a.m. and 9 a.m., but the average price for a round trip is $13.09, the report said. About 30 percent fewer cars are entering the roadway at 5 a.m., according to the state. Komaragiri tries to time his commute strategically to make it to the I-66 gantry at 9:30 a.m. when the morning toll hours end. If he is a few minutes early, he waits on the shoulder, as do dozens more commuters on roads leading to the 66 Express Lanes, risking a $30 fine plus $66 in court costs and three points on their driver’s licenses. The Virginia State Police says it’s a risk too many commuters are taking. There is also evidence that some commuters are trying to cheat the system: solo drivers switching their E-ZPass transponder to carpool mode and hoping they don’t get caught. An enforcement blitz on the morning of Nov. 30 netted 13 citations for such commuters. In 10 months following the system’s opening, the state police issued 614 HOV violations, according to records. Komaragiri, a government contractor, says the risk is worth it because by the time he reaches the I-66 ramp he has paid $6.65 in tolls on the Dulles Greenway and $2.50 on the Dulles Toll Road. The thought of a third — and unpredictable — toll is unbearable, he said. 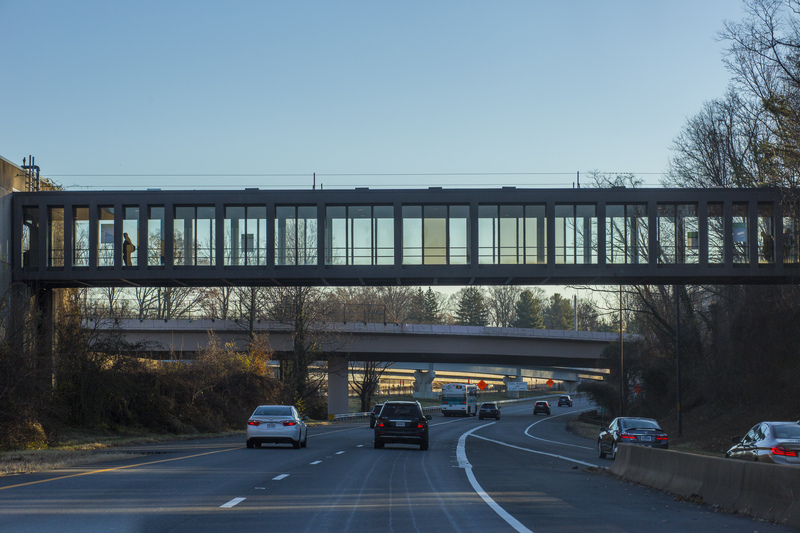 The 10 miles of rush-hour, peak-direction toll lanes between the Capital Beltway and the District line are thought to be the only such system in the country. State officials said the goal of the lanes was to move more people and enhance mobility through the corridor. As part of the program, rush-hour periods were extended 90 minutes. The tolls are in effect from 5:30 to 9:30 a.m. eastbound and 3 to 7 p.m. westbound, Monday through Friday — an expansion of the toll window with an earlier start and a later end. Despite the unintended consequences, state transportation officials say there are indications the tolls are doing exactly what they were designed to do. More commuters are carpooling, which has taken some vehicles off the road, they say. 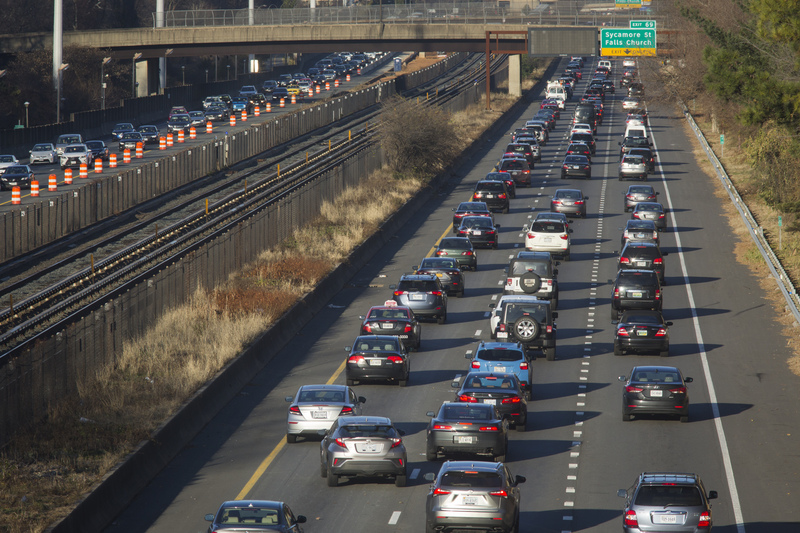 The number of vehicles traveling with two or more people on I-66 inside the Beltway during tolling hours has increased 25 percent since January, to about 15,000 from about 12,000, according to the VDOT report. However, the majority of road users are still solo drivers who are paying tolls. “I don’t think you are going to see us declare outright success, but we are seeing positive indicators,” Donohue said. Metro ridership is up at some stations in or near the corridor and on some buses that travel through it. A month after the tolls began, data showed, the total number of riders taking Metro in the morning increased slightly. By June, ridership at the West Falls Church and East Falls Church stations was up an average of 200 riders, or 5 percent, according to data from Metro. The increase represents the highest average ridership at the stations — both along I-66 — in at least two years, though it’s unclear whether it can be tied directly to the tolls. Data show that the outermost station on the Orange Line, Vienna, had no detectable change in average ridership after the toll lanes opened. Since the toll system started, ridership on commuter bus systems serving Prince William and Fairfax counties is up, as is that of buses that connect riders to the Metro system in Tysons, according to data from transit operators. A new route from the Fairfax County Government Center to the District’s West End via I-66 that averaged seven passengers on opening day now averages 27 per trip, according to officials with the Fairfax Connector. In Prince William, ridership is up about 12 percent on buses that ferry commuters from Gainesville and Manassas to Metro stations in Tysons. Ridership has increased about 6.6 percent on commuter buses from Prince William to the Pentagon and the District, officials with the ­OmniRide bus system said, though they attributed the increase to the introduction of half-price fares in May, an incentive that will continue until the next toll system opens in 2022. But critics say there still aren’t enough alternatives for those who want to give up their cars. In interviews, many commuters recounted repeated attempts to try transit only to find park-and-ride facilities for both Metro and commuter buses full. Northern Virginia officials say more park-and-ride facilities are under construction, funded by toll revenue. In the first 10 months of operations, the toll system generated nearly $18.5 million in revenue, according to VDOT, money used to support tolling operations, maintenance of the facility, and transit and other transportation improvements in the corridor. The agency’s budget projects the 66 Express Lanes will yield $25.3 million in fiscal year 2019, of which $15.4 million will go to fund multimodal improvements. The Northern Virginia Transportation Commission, which manages the toll revenue dedicated to transportation and transit improvements in the corridor, approved $12 million in new projects last summer, including $7.2 million for new or enhanced bus service. In preparation for the toll system’s opening last year, the commission awarded $10 million in grants for projects, including new express buses from Fairfax and Prince William counties. “I don’t like the 66 tolls, but if we’re going to have them, let us have as much transit as we can have,” said state Del. Danica A. Roem (D-Prince William), who fought unsuccessfully during the last legislative session to cap the tolls and reduce the tolling hours. Meyer, the Loudoun supervisor, agreed, saying transit hasn’t been significantly improved, while the tolls have made driving a burden on many commuters. “VDOT’s approach has been ‘Hey, lets make driving totally unaffordable and not workable for people so they use transit.’ Instead of making the transit system much better,” he said. Transportation officials acknowledge the challenges and the need for more transit improvements. But they also highlight state data showing that the road users — including those on commuter buses — are now getting to their destinations faster and spending less time in traffic. Express lane speeds average 52.6 mph during the morning rush, compared with 43.8 mph before the tolls, saving at least a couple of minutes of travel time, they say. It’s worth noting, however, that those are average speeds and do not mean that express lane users never experience congestion or stop-and-go traffic. State officials say it’s too soon to say where the new travel patterns will settle. Commuters will see another major change in the roadway in two years when the state completes a widening project in the eastbound lanes and then again in 2022 when it extends the tolls outside the Beltway and the HOV requirement changes to HOV-3. “Our goal here is to continually examine how this road is performing and to take steps to help move more people,” said Donohue, the deputy transportation secretary. When the toll system opened, Fairfax resident Rahul Vachhani could no longer ride solo in his hybrid during rush hour unless he was willing to pay the toll. Two of Vachhani’s co-workers also adjusted their commutes. One started her workday later so she could time her commute to enter the interstate when the tolls lift. Another switched his commute from I-66 to U.S. Route 50, where the drive from Northern Virginia into downtown goes through stretches of bumper-to-bumper traffic, further slowed by numerous traffic signals. The three are illustrative of thousands of commuters who have changed — or tweaked — their commute routines to avoid paying the tolls, data showed. Historically, traffic volume on the interstate would begin surging around 5 a.m., reaching its peak by 9 a.m. and leveling out through the afternoon. Traffic patterns shifted immediately after the tolls opened on Dec. 4, 2017. Today, 30 percent fewer vehicles enter the roadway at 5 a.m. It fluctuates, but that’s about 12,000 fewer vehicles each month during the workweek, according to the Post analysis. However, the volume of vehicles entering the highway when the tolls end at 9:30 a.m. continues to increase for about 90 minutes, inadvertently extending rush hour. In addition, parallel roads leading into the District, including U.S. Route 29, have seen slight increases in traffic volume, though state reports indicate travel times have not increased significantly. Traffic volume on Route 29 between 5 and 9 a.m. increased 4.6 percent immediately after the toll system opened, according the Post analysis of state traffic data. On the George Washington Memorial Parkway, speeds have dropped 3 percent during the morning rush in the last year — though officials won’t directly link the changes to spillover from the express lanes. Arlington County resident Tyler Anbinder says his commute on Lee Highway (U.S. Route 29) has worsened. 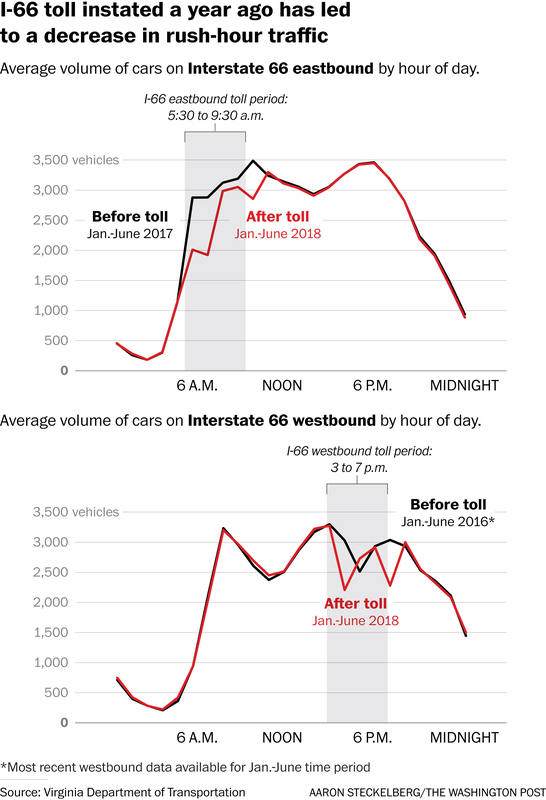 An examination of data for westbound traffic during the afternoon commute reflects similar findings: fewer cars on the road during tolling times but a surge of vehicles right before and after tolls lift. Westbound tolls have not been as high as mornings, however, because the evening commute is more staggered, likely due to workers having more flexibility in when they can leave downtown. David Salzberg said the toll system has been a “life changer.” A research scientist who commutes from Vienna to Ballston for a 7 a.m.-to-4 p.m. shift, Salzberg saves more than 30 minutes on his trip home by taking the 66 Express Lanes. He continues to take side streets in the morning but is willing to pay tolls of about $4 in the afternoon. In exchange, he gets home in 20 minutes instead of the 50 minutes it would take on surface streets. Prince William resident David Vergun has endured a year of route testing around the tolls — and a much more complicated commute. Before the express lanes, he would time his commute to get on I-66, inside the Beltway, around 6 a.m., before the HOV restrictions kicked in at 6:30 a.m. Now he gets up an hour earlier to avoid getting caught on the highway when the tolls start at 5:30 a.m. He takes the Virginia Railway Express regularly, but the commuter train isn’t an option when he has evening meetings in Arlington and the last train leaves at 7 p.m. Finding a passenger to carpool with isn’t feasible for the Defense Department journalist with a complicated schedule. And the few times he tried taking Metro from the Vienna station, he had trouble finding parking. His best choice is leaving home at 4:30 a.m., a good three hours before the start of his shift. “I try to make the most of it. I go in early and work out in the gym or go jogging or something,” he said. Vachhani turned to the region’s unique version of ride-share: slugging. His schedule didn’t quite match the bus schedules from Fairfax County to downtown Washington. He didn’t know anyone with whom he could carpool. So he joined a Facebook group of commuters looking for riders or rides and stops at the Vienna Metro station each morning to pick up a travel companion, which allows him to set his E-ZPass transponder to carpool mode and travel toll-free. “I wasn’t ready to pay $14 or more in tolls,” said Vachhani, a project manager at the American Chemical Society. He found a regular slugger who was also looking to avoid the tolls. Luz Lazo is a transportation reporter at The Washington Post covering passenger and freight transportation, buses, taxis and ride-sharing services. She also writes about traffic, road infrastructure and air travel in the Washington region and beyond. She joined The Post in 2011. John D. Harden is a metro data reporter for The Washington Post. He joined The Post after four years working for the Houston Chronicle as a data and breaking news reporter.